Art makes my eyes hurt. Matisse is often quoted as saying he wanted his work to be like an armchair for a tired businessman, but a lot of art I have seen recently looks more like electro-convulsive therapy for the catatonic collector. The Eyeball-Buster appears to be having something of a comeback. I have seen a few things recently that were physically uncomfortable to look at. I am not totally familiar with the brief history of Op-Art from the 1970s – Vasarely et al – and I know there was some revival of it in the neo-geo moment at the very end of the 1980s, but maybe it’s one of those underground sub-genres that never really goes away. All I know is that I have seen quite a bit of plexiglass in the last few weeks. 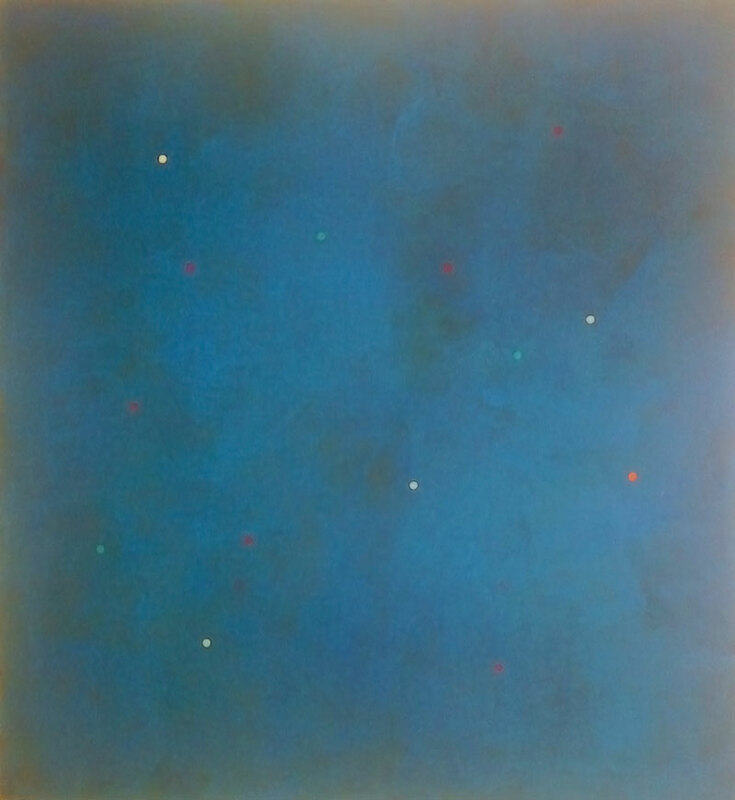 First at the Annely Juda gallery in Dering Street I saw spots in front of my eyes. Essentially these paintings comprise of pseudo randomly spaced dots on a monochrome background. After about twenty seconds I was seeing dots of complimentary colours as if I was just about to get a migraine. Was this intentional? 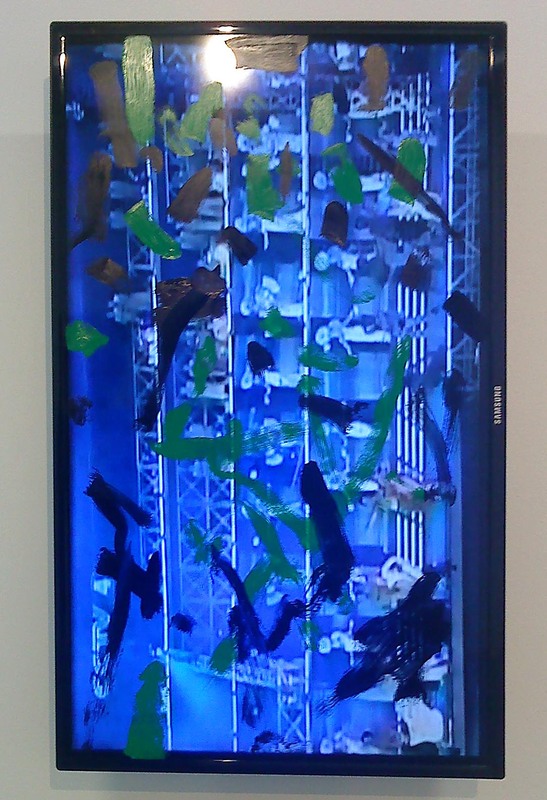 Ken Okiishi at Pilar Corrias in Eastcastle street manages to combine two dubious genres in one – the abstract video installation and op-art – with his recent paintings on flatscreens. This show radiated high seriousness, claiming that it “subverts the material claims of the media” . I was actually unable to look at the work for more than a couple of seconds before succumbing to a kind of stationary motion sickness. Dan Flavin has a work showing among the many other good things in the current show at Hauser & Werth in Savile Row. In a darkened room the effect is intense, dreamlike: like a ghostly spire or an alien beacon – not qualities that you might associate with the work merely viewed in illustration where it can look utilitarian, plain even. When fluorescent tubes were commonplace Flavin’s work looked puzzling to some, but as they are phased out they will look more monumental. As long as someone keeps making them to replace them in the sculpture…it seems thoughtful and I have never had a problem looking at them before, but this one was really hard to be with. Richard Serra has a series of prints at the Alan Cristea gallery in Cork st. They are plain black shapes on white grounds. But claustrophobically close to the edge of the frame and all just a little off the vertical. The combined effect is to make you feel a little seasick as you lose your sense of what is upright. Then you see that the black is not entirely plain but it has the texture of recycled tyres, or a new road which should be on the ground, not on the wall. Should come with a hangover warning. Serra must like his work to seem dangerous and slightly hostile – viz his large sculptures in Broadgate which were so unpopular because of their threatening attitude. But he is only revealing a truth – cities are inimical, hostile places to the individual on the ground. Serra has managed to connect a physical sense of disquiet to his work to convey this. Serra’s work is just about the right side of uncomfortable, for me anyway. And in a way it’s good to feel something when looking at art. But sometimes what you feel is not good. I am going to sit down in my armchair now. I am feeling a little tired. This entry was posted in Art, British, Contemporary, Galleries, Modernism, Painting, Uncategorized and tagged 1970s, Annely Juda, Art, Cork St, Eyeball buster, Flavin, Galleries, Hauser & Werth, London, Matisse, Op-Art, Painting, Sculpture, Serra, West End. ← Poor Art, but not for poor people.